The Business & Human Rights Resource Centre (BHRRC) is a nonprofit, nongovernmental organization dedicated to encouraging companies to respect and promote human rights around the world.Since its founding in 2002, the Centre has pursued its mission by advancing transparency, public accountability, and informed decision-making. The Centre’s website is an essential forum for collecting and disseminating information about the human rights impacts (both positive and negative) of over 5,100 companies, operating in over 180 countries. By actively seeking responses from companies to allegations of misconduct, the Centre helps ensure those companies address concerns raised by civil society and provides balanced coverage of issues.Taking international human rights standards as their starting point, the Centre also operates as an essential online library of guiding principles and standards, as well as best practices and model business policies.With offices in London and New York and a global research network with bases in Brazil, Colombia, Hong Kong, India, Jordan, Lebanon, Kenya, Senegal, South Africa, Thailand, UK, Ukraine and the USA, the Centre can draw global attention to the local human rights impacts of companies around the world. Through close contacts with grassroots NGOs and local business people, an International Advisory Network of over 70 experts, and Academic Partners at 23 institutions with expertise in business and human rights, the Centre has created a hub of information exchange unlike any other.Businesspeople, advocates, governments, investors and the UN all rely on the Centre’s coverage of allegation and reference materials on business and human rights standards. By exposing the reality in a field too often dominated by rhetoric, the Business & Human Rights Resource Centre helps protect vulnerable people and communities against abuses. The award was presented on November 14, 2013 in Konover Auditorium at the Thomas J. Dodd Research Center, University of Connecticut, Storrs, CT.
Download the 2013 Dodd Prize Press Release. 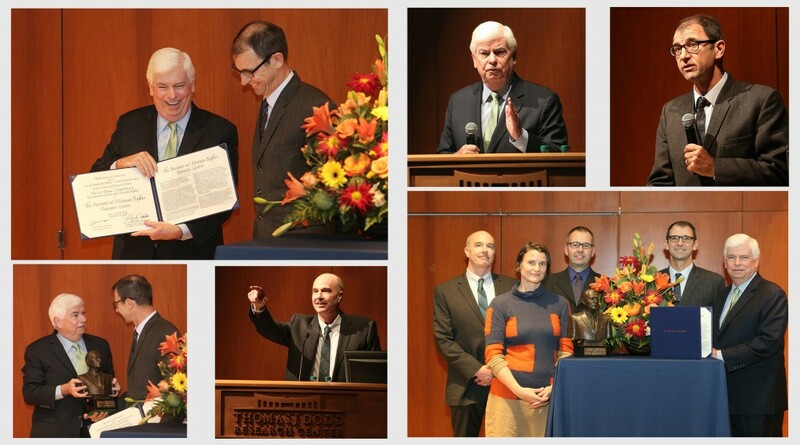 Download the 2013 Dodd Prize Ceremony Press Release. Download the text of Chris Avery’s Keynote Speech.